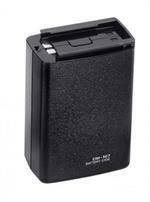 CM-166 : 12volt 1300mAh long-life Ni-MH rechargeable battery for ICOM IC-A22 & IC-A3 radios. Home > Aviation Batteries > CM-166: 12volt 1300mAh long-life Ni-MH rechargeable battery for ICOM IC-A22 & IC-A3 radios. 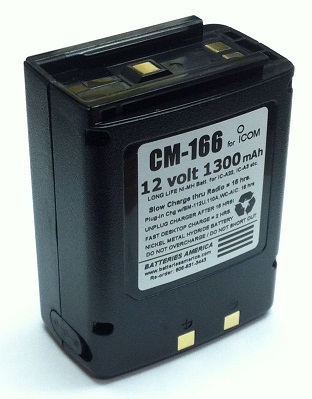 CM-166: 12 volt 1300mAh rechargeable LONG LIFE Ni-MHl Metal Hydride battery for ICOM IC-A22 & IC-A3 radios. Battery is 3.25" tall (same size as original). 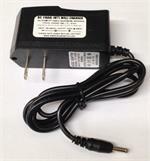 Provides High-Watt transmit power, and LONGER operating time. Replaces original ICOM CM-166. It can be re-charged 3 ways: (1) with Wall Charger (WC-166, BC-110, etc) plugged into side, or (2) Through the radio (with a Cig. lighter cable or Wall Charger); or (3) in a desktop Rapid Charger (such as the EMS-166).